With more than one-third of U.S. adults and nearly 18 percent of U.S. children described as obese according to the Centers for Disease Control, technology is more important than ever as a major tool in reversing those trends. Windows 8 apps integrate personalized coaching, nutrition advice and fitness gaming into active routines. 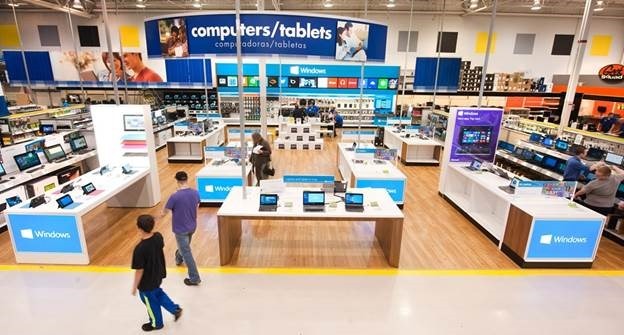 Back in June, Microsoft promised to build Windows Stores in 500 Best Buy locations across the US and more than 100 Best Buy and Future Shop locations in Canada, launching from late June through September. Today the company is delivering. Although it’s not clear how many of the stores have opened already, Microsoft has now changed its plans to say the store-within-a-store experiences “will launch throughout August and September.” The West Los Angeles Best Buy Store appears to be one of the first, with Major League Soccer present to “kick off” (we think Microsoft intended that pun) the opening. The event will include soccer drills on a full-size field in a parking lot, healthy food tips, and the showcasing of “the latest Windows 8 fitness and nutrition apps.” Microsoft made a point to underline five of them: BallStrike, Daily Workouts, Endomondo, LIVESTRONG.com MyPlate Calorie Tracker, and Fitbit. The Windows Stores inside Best Buy and Future Shop are supposed to range in size from 1,500 square feet to 2,200 square feet. Each one features an “innovation space” highlighting a variety of Windows scenarios across devices, a showcase section with the latest Windows-based PC form factors (ultrabooks, convertibles, detachables, all-in-ones, portable devices, and so on), as well as a standalone area just for the Microsoft Surface.